WHEN DAVID LUKS WAS DIAGNOSED with testicular cancer in 2006, he didn’t understand how such a thing could happen to someone who ran five miles a day in Central Park. “I had no perception of what cancer was,” he says. Luks, born and raised in Brooklyn Heights, a former student of Brooklyn Friends School and Bay Ridge’s Poly Prep, was 31 at the time of the diagnosis. Although he knew little about what he was facing, he learned quickly — that testicular cancer is most often diagnosed in men between the ages of 18 and 40, and that it has a high survival rate if caught early, as his was. Among the literature he read was a report from Johns Hopkins University about honey — about how it’s an energy-sustaining complex carbohydrate (as opposed to buzz-and-crash inducing fructose) filled with antioxidants, vitamins and minerals. This triggered a memory of seeing runners in the park swallow spoonfuls of honey, although he hadn’t previously considered why they were doing so. That’s when Luks began shopping, scrutinizing product labels. He found that many products with honey in the name actually list fructose as the first ingredient and honey as the last. He called the largest supplier of industrial honey in the U.S. and discovered that they cut their product with a large percentage of fiber so it can be powdered. “Seventy percent honey is not 100 percent. That’s kind of weird,” he thought. This is when he saw an opportunity for a product made with ‘legitimate’ honey. After experimenting with 40 organic varieties — those protected by a two-mile pesticide-free radius — and eliminating those with odd taste and smell, he found a supply that he calls “one of the more pure honeys in the world” from the interior of the Amazon rainforest in Brazil. 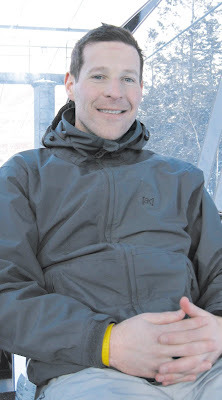 With it he created Deluxe Honeydrop (David Luks’ nickname is “Deluxe”), a honey and juice-infused beverage that he launched in October at Natural Products Expo East trade show in Boston, the largest natural products trade show on this coast. Of 116 beverages, Deluxe Honeydrop won Best in Show. Through connections Luks made at the show, the drink was just added to the beverage case at 17 tri-state area Whole Foods supermarkets. Yesterday was his debut, sampling the drink to Whole Foods customers in Tribeca. He is also selling the product to yoga and Pilates studios in Brooklyn, “just me, myself and a van.” He says the buzz has been good. Pun intended. 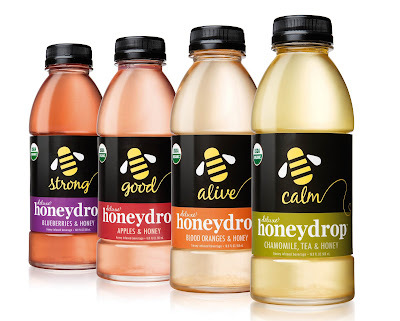 One amazing consideration in Luks’ beverage journey is that Deluxe Honeydrop has been only eight months in the making. And although the honey he uses is the most expensive he sampled, a 16-ounce bottle at Whole Foods is just $1.79. The current Upper East Side resident, whose parents still live in the Heights, hopes to move back to Brooklyn. Visit www.honeydrop.com for more information or to contact Luks. LAST WEEK’S OPENING OF THE GOWANUS CANAL CONSERVANCY’S holiday group art show and sale, Gowanus: A Sense of Place, drew more than 150 art lovers to this new gallery space on Bond Street in Carroll Gardens. The show, which runs until Dec. 22, highlights the work of 15 local artists who paint and photograph the streets of Gowanus and the neighborhoods around it. The venue is a new space at 298 Bond St., between Union and Sackett streets, one block from the Gowanus Canal, the geographic center of the show. The works on the walls reflect the streets and bridges and buildings for several miles around, in the neighborhoods of Park Slope, Carroll Gardens, Cobble Hill, Boerum Hill, Red Hook, and of course Gowanus itself. One of the painters represented in the show, NICHOLAS EVANS-CATO, suggested that Gowanus may be one of the most painted districts anywhere in the world, comparable to Venice in the 19th century. “In fact,” he added, “this collective activity has created a veritable ‘Gowanus School.’” His father, EDDIE EARL CATO, came to live and paint there in the 1960s, when he was no longer able to afford Manhattan, and Evans-Cato has done the same. Numerous oil paintings, watercolors, photographs and other media are on sale, with an emphasis on smaller works, and nearly all priced between $150 and $1,000. The show and sale will be open on Saturdays and Sundays from 11 a.m. to 7 p.m., on Thursdays 3 p.m. to 8 p.m., and Fridays 3 p.m. to 6 p.m. The show closes Dec. 22 with a “Final Sale Day” from 11 a.m. to 7 p.m. Further information is available by calling LAUREN COLLINS at the Conservancy office, (718) 858-0557, or visit www.gowanuscanalconservancy.org.